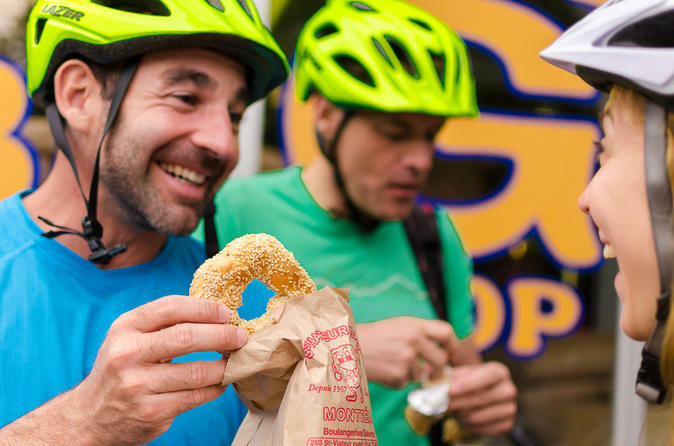 Cycle, snack and drink your way around Montreal’s food scene on this 5-hour laid back guided bike tour. An original tour of Montreal‘s typical delights with urban and gourmet discoveries. With our certified professional guides, discover Montreal’s different neighborhoods and discover locals’ favorite eateries. Combined with some walking and lots of spicy comments about the history, architecture and food of Montreal, this bike tour will undoubtedly whet your curiosity. At the end of your adventure, relax and enjoy a drink in historic old Montreal! Head over to the best site to begin your tour: our bike shop located in historic Old Montreal, right on the bike path where you will be provided with a bicycle, helmet, lock and a bottle of water. After a quick safety briefing, hop on your bike and follow your guide for your 5-hour laid back tour. Food tasting stops included: Montreal’s famous bagels at Saint-Viateur Bagel shop * German sausage sandwich at the Jean-Talon market * the “vrai gnoccis de la nona” in Little Italy * a gelato at “Les Délices de l’Érable” * a glass of beer or wine in Old Montreal. Your tour ends at the starting point. Pick up a bike map and tips from your guide on where to go next. You can drop off your bike now, or pedal off to explore the city on your own and return your gear to the shop before closing time.